Together with the Urbanscope team, we gave a TedX talk on the topics and results of the project here at Politecnico di Milano. The talk was actually given by our junior researchers, as we wanted it to be a choral performance as opposed to the typical one-man show. The message is that cities are not mere physical and organizational devices only: they are informational landscapes where places are shaped more by the streams of data and less by the traditional physical evidences. We devise tools and analysis for understanding these streams and the phenomena they represent, in order to understand better our cities. Two layers coexist: a thick and dynamic layer of digital traces – the informational membrane – grows everyday on top of the material layer of the territory, the buildings and the infrastructures. The observation, the analysis and the representation of these two layers combined provides valuable insights on how the city is used and lived. 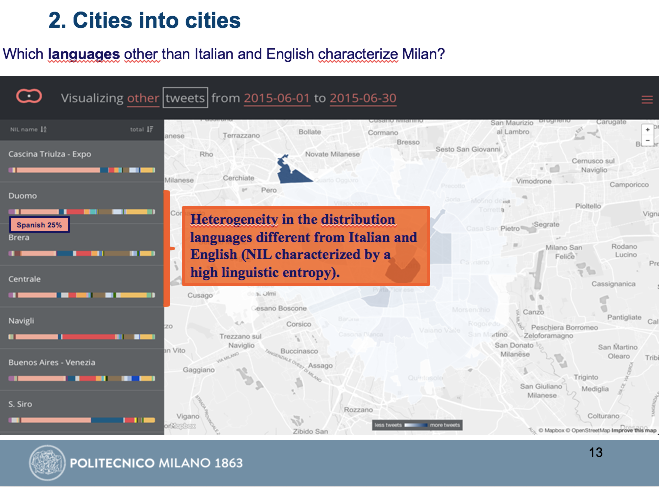 Urbanscope is a research laboratory where collection, organization, analysis, and visualization of cross domain geo-referenced data are experimented. The research team is based at Politecnico di Milano and encompasses researchers with competencies in Computing Engineering, Communication and Information Design, Management Engineering, and Mathematics. The aim of Urbanscope is to systematically produce compelling views on urban systems to foster understanding and decision making. Views are like new lenses of a macroscope: they are designed to support the recognition of specific patterns thus enabling new perspectives. and discover the other data science activities we are conducting at the Data Science Lab of Politecnico, DEIB. (UK). He has been named one of Fortune magazine’s 2014 Data All-Stars, and spoke about “happy maps” at TED. His research has been focusing in the area of urban informatics and received best paper awards from Ubicomp 2014 and from ICWSM 2015, and an honourable mention from ICWSM 2013. He was Research Scientist at Yahoo Labs, a Horizon senior researcher at the University of Cambridge, and Postdoctoral Associate at the department of Urban Studies and Planning at MIT. He received his PhD from UC London. His thesis was sponsored by Microsoft Research and was nominated for BCS Best British PhD dissertation in Computer Science. His presentation will contrast the corporate smart-city rhetoric about efficiency, predictability, and security with a different perspective on the cities, which I think is very inspiring and visionary. “You’ll get to work on time; no queue when you go shopping, and you are safe because of CCTV cameras around you”. Well, all these things make a city acceptable, but they don’t make a city great. Daniele is launching goodcitylife.org – a global group of like-minded people who are passionate about building technologies whose focus is not necessarily to create a smart city but to give a good life to city dwellers. The future of the city is, first and foremost, about people, and those people are increasingly networked. We will see how a creative use of network-generated data can tackle hitherto unanswered research questions. Can we rethink existing mapping tools [happy-maps]? Is it possible to capture smellscapes of entire cities and celebrate good odors [smelly-maps]? And soundscapes [chatty-maps]? The seminar was open to the public and hosted at the Polo Regionale di Como headquarters of Politecnico di Milano, located in Via Anzani 42, III floor, Como. You can also download the Good City Life flyer. When people talk about smart cities, the tendency is to think about them in a technology-oriented or sociology-oriented manner. However, smart cities are the places where we leave and work everyday now. Here is a very broad perspective (in Italian) about the experience of big data analysis and smart city instrumentation for the town of Como, in Italy: an experience on how phone calls, mobility data, social media, people counters can contribute to take and evaluate decisions. You can read it on my Medium channel. This year we decided to be present at ICWSM 2016 in Cologne, with two contributions that basically blend model driven software engineering and big data analysis, to provide value to users and citizens both in terms of high quality software and added value information provision. Model Driven Development of Social Media Environmental Monitoring Applications presented at the SWEEM (Workshop on the Social Web for Environmental and Ecological Monitoring) workshop. We now continuously look for new dataset and computational challenges. Feel free to ask or to propose ideas! CityOmeters, the complete solution proposed by Fluxedo for smart city management that includes social engagement via micro-planning and big data flow analytics over social content and IoT, has been presented today at EXPO 2015 in Milano, in the Samsung and TIM pavilion.